Handypersons schemes are helping elderly people to carry on living in their own homes. Returning home from hospital after a fall, or facing the mountain of climbing a step when you are elderly can be daunting, but help through handypersons services can go a long way to reducing these worries. A new independent report commissioned by the Department for Communities and Local Government shows that handypersons services around the country are showing that they are value for money and help elderly people to carry on living in their own homes with confidence. I would like to thank you and the department for the service of your ‘handyman’. The relief to be able to pull myself up the step to my door is beyond words. I am having so much pleasure from it that I felt the least I could do was return thanks. The report says handypersons services, can reduce the risk of injury or even death through preventing further falls, reducing risk of burglary or fire. These preventative services are cost effective, for example postponing entry into residential care can save up to £28,000 per year per person. Many local authorities now have handyperson services kick-start funded from DCLG. Handypersons services generally support older people and people with disabilities. These services are often part of the arrangements made to enable people to be discharged from hospital to return to a safe home environment. Services are provided through in-house staff, housing associations, or independent providers including charities and individual traders. DCLG has funded handyperson services from 2009 through direct grants to kick start services where they did not exist and build the capacity of others. From April 2011, handypersons funding will be rolled into unringfenced formula grant as part of the government’s decentralisation programme but local authorities were informed that the national allocation is £15.5 million for 2011 to 2012 and £13.5 million for 2012 to 2013. 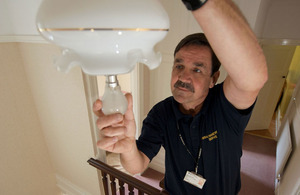 Wirral Metropolitan Borough Council has been running its handyperson service since 2005 and works in partnership with the local Home Improvement Agency. Through joining up the handyperson service with occupational therapy, adult social care, the Home Improvement Agency and social landlords, they have succeeded in reducing the waiting list for major home adaptations by 12 months. I recently had a keycase fitted and thus I am now, no longer beholden to anyone else to hold keys on my behalf. This is very comforting. From my first contact with a man who provided me with the correct number to the lady at the handyperson service who arranged it my personal thanks. George, who fitted it, was efficient and friendly and also notified the code number etc. to the right people, which was a big help. I wish to put on record my appreciation. Any organisation is only as good as its staff. Feedback from clients shows that their gardening service is also appreciated. A garden becoming increasingly overgrown can be a great worry and it also advertises that a vulnerable, often older, person lives there. On behalf of me and my husband, I would like to thank you for the excellent service provided by the handyperson. The handyperson is such a very special person, does such a good job in a friendly cheerful manner, nothing is too much trouble. Please give him my thanks. Wirral’s gardening service has also helped a young person with Asperger’s syndrome giving him work experience that greatly helped his confidence.